COPS junior medallists at the county championships. 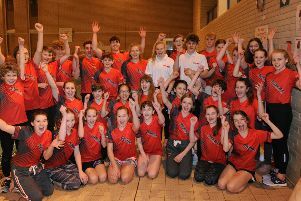 City of Peterborough Swimming Club (COPS) were once again the major force at the Cambridgeshire County Championships. The championships were spread over three weekends in Cambridge and COPS finished with an impressive 319 medals - 118 of which were of the golden variety. COPS swimmers Amelia Monaghan and Herbie Kinder receive the top club trophy. No less than eight COPS swimmers finished as top boy or girl in their age groups. 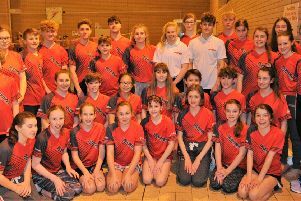 They were Safford Hewitt-White (eight gold medals), Fabian Brudnicki (nine golds), Jessica Shaw (seven golds), Harriet Salisbury (nine golds), Olivia Mahoney (nine golds), Megan Donovan (seven golds), Herbie Kinder (five golds) and Amelia Monaghan (five golds). Head coach Ben Negus was naturally dlighted. He said: “COPS have long dominated the county championships but each year this is never taken for granted. We still work extremely hard for the event. “The whole club from development level to national level train hard to ensure we maximise our medal haul. It’s an extremely special championship for the club and a big training focus across all ages. “Our younger A squad swimmers (14/15 years of age) were outstanding this year. Each of them entered every race they qualified for thus giving them an extremely heavy race schedule and they coped extremely well. I was delighted with their application. “And I’m very pleased to see some of our younger age-group swimmers start to show their potential. The number of female 11/12yrs girls qualifying for regionals is up on last year, and they are showing signs of positive racing habits in the 50m and 100m events. “I am extremely proud of our squad. They raced hard, fought for every medal and came together as one team. “The skins events and relays in the last session were electrifying. “Mia Leech won the girls skins for us with Poppy Richardson coming second and Herbie Kinder came second to Cambridge swimmer Matthew Titman in the men’s skins.